(Bloomberg Opinion) -- The 3 billion kroner ($353 million) rights offering announced by Norwegian Air Shuttle ASA on Tuesday brings its efforts to lead an aviation revolution back down to earth. The share offering should provide the budget long-haul carrier with enough funds to tide it over the winter and prevent a breach of debt covenants. But the money comes at a price. It equates to almost half of the airline’s market capitalization before the announcement – a whopper in anyone’s book. Together with the 2.5 billion kroner yearly pretax loss disclosed on Tuesday, it suggests CEO and co-founder Bjorn Kjos’s big-spending flight path was imprudent. Fortunately, Norwegian does seem to recognize that it can’t go on as before. It’s having to give up some of its swashbuckling ways and Kjos may have less influence in future. A rights issue is better than going bust, in which case shareholders would probably get nothing. Naturally, nervous bondholders are pleased too. 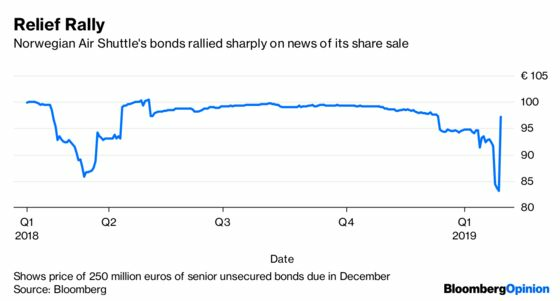 Norwegian gets cash to deal with a 250 million euros ($286 million) bond that matures in December. Nevertheless, after another big selloff on Tuesday, the shares have now fallen by about 60 percent since April. Back then, the stock was buoyed by hopes that British Airways owner IAG SA might acquire its upstart Norwegian rival. But IAG boss Willy Walsh and Norwegian’s board couldn’t agree on a fair price, and Walsh walked away last week. In the past, Norwegian was all about growth. In 2012, it placed the biggest commercial aircraft order in European history and set about shaking up transatlantic travel. That was fantastic news for passengers: Norwegian has shiny new jets and offers rock bottom fares. But it always looked a stretch financially. Now Norwegian says its focus will “be on cost-savings and capex reductions.” Selling planes, postponing new aircraft deliveries and cutting routes sounds like cold hard financial reality kicking in. Though Kjos and his chairman Bjorn Kise will take part in the share sale, their 22 percent interest will probably be diluted. Norwegian’s statement also revealed that large shareholders are pushing for greater influence on board appointments. Billionaire John Fredriksen, a man known for driving a hard bargain, is back-stopping the rights offering. If this means Norwegian’s board will be less in thrall to the co-founders – something I questioned here – that’s a good thing. While we don’t know what terms IAG was offering, it’s hard to imagine they were worse than where the stock is now. Telling shareholders on Tuesday that the board remains “willing to engage in consolidation discussions” is no consolation. In fairness, Norwegian has had plenty of bad luck. Rising oil prices, a capacity splurge by rivals that depressed fares and technical troubles related to Rolls-Royce Holdings Plc’s engines have all caused problems. Still, that’s the nature of this business, which is why most airlines aren’t as gung-ho as Norwegian. The fact that rivals are now copying Kjos’s low-cost long-haul strategy suggests his place in the aviation annals of fame is assured. It’s increasingly doubtful, though, that the recent vintage of shareholders will remember him so fondly.